Traveller's Tales: A Massage at 36,000 Feet! 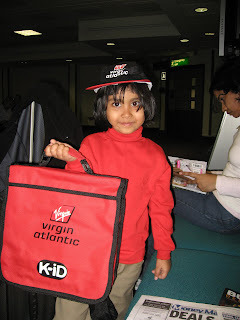 I flew on Virgin Atlantic from Mumbai to London and back. Here’s the low-down on their much talked about upper class. Hello Gorgeous! welcomes the airline’s website as I hunt for baggage restrictions, having heard about strict baggage restrictions in European airports. I notice a prominent link about delayed bags in Heathrow. Heathrow airport’s reputation seems to be nose-diving if you go by the number of negative articles appearing in print now-a-days. I find that British Airways tops the list of airlines for lost bags in Europe. However, the Travel Gods were with me during this vacation; the sight of my mutilated suitcase appearing on the baggage carousal has never made me happier! The Virgin staff is smartly dressed and very friendly (for a European run airline, not unusually so if you are used to flying Singapore, Cathay or Jet Airways). In Mumbai one of the girls even escorts us from the check-in counter to the the lounge. They board the Economy section before announcing boarding of the Upper Class; this gives us more time in the lounge and less waiting in the airplane which is different from the standard practise of most other airlines. The cabin has an unique design. Seats are placed diagonally and every seat had aisle access. While seats on the new Singapore Airlines business class are wider, Virgin’s seating allows for more social contact (but less privacy). The seats convert into fully-flat beds and they provide a duvet, pillow, sleeping suit, the works! They also have a unique, full-service bar with a dozen bar-stools around it where you can socialize with fellow passengers. 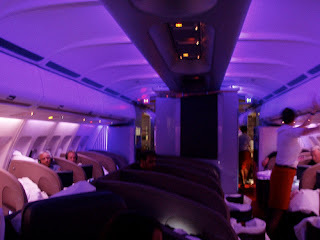 Mood lighting in red and purple gives the cabin a very distinct chic appeal especially when the lights are dimmed during the flight. Note: Cabin picture by Englishman. The other unique (and by far the coolest!) service they provide is that of a trained beautician/masseuse who will offer a head & shoulder massage, a manicure, etc., when you are flying at 36,000 feet. This service is not guaranteed especially if the flight is full. That is so much fun even though the massage lasts only for 15-20 minutes. Strongly recommended! Food was not particularly great on my flight from Mumbai to London, but the selection on the return flight was better. The entertainment system is a let-down. They do not yet have Video On-Demand and the number of choices available to us was few. The exeprience during our return journey from London to Mumbai was even better. 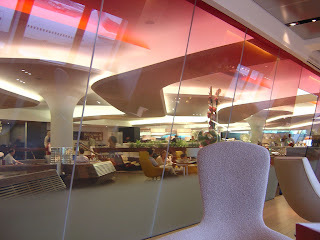 The Virgin Clubhouse in Heathrow is the most elaborate lounge I have ever visited. Chic design, mood lighting, a-la-carte menus, full-service bars, sushi, billiards, salon, spa, showers: you name it, it’s here! I was actually hoping I had more time to spend there instead of my 90 minutes which passed very quickly. Note: Clubhouse picture by Gary. Note that Virgin provides complimentary limo services to passengers who fly on a full-fare business-class ticket in many cities including Mumbai and London. They also have arrival lounges at select cities where you can shower before you leave the airport. Sounds like a gorgeous way to fly and sleep and actually feel restated in stead of exhausted when at the destination. Talking about restriction: In Norway they have started with bio (using your finger) registration. I feel they've gone to far. @mitesh: I have sent you an email. @rennyba: Actually the US requires fingerprinting for all visitors, so I am used to that already. Yup, it is no longer as easy as it once was.